How do you transition to new content in a smooth and seamless way? How will these design decisions impact the user experience (UX)? Those are the types of questions most people don’t care to think about. Except designers. There are various ways our designs can react to things such as image-loading, screen transitions, and pull-to-refreshes. If you’re looking for ideas on how interaction designers are improving usability and UX by way of transitional interfaces (which commonly refers to the art and science of UI animation) check out the site called Use Your Interface. User Your Interface is a design showcase of interaction designs and transitional interfaces from sites and apps that behave beautifully when responding to user-initiated events. 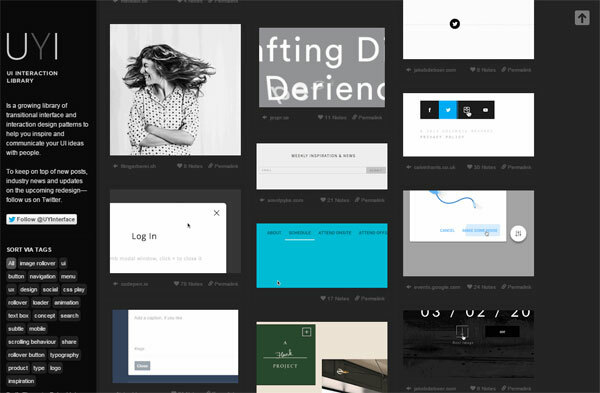 Featured designs are tagged with keywords such as image rollover, menu, and loader to help you quickly navigate to the stuff you’re interested in. This field of digital design involves movement and animation, so Use Your Interface showcases animated images. A Modern Approach to Improving Website Speed	What Makes a Good Photograph?